In line with clients' variegated requirements, we bring forth a distinguished collection ofHeavy DC Adaptor. The offered adaptor is designed at our ultra-modern manufacturing unit using the superb quality raw material and progressive technology. Being a quality-oriented organization, we assure our clients that the offered adaptor is excellent on counts of durability and quality. Our offered adaptor is used for protecting electrical devices from internal voltage reduction. 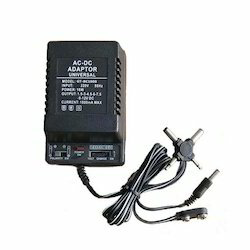 This Heavy DC Adaptor is available in different specifications as per clients' specific requirement. Capacity: 2 Amp. / 3 Amp. Operating Volt: 230 V AC. Pioneer in the industry, we are engaged in offering an impeccable range of DC Adaptor. 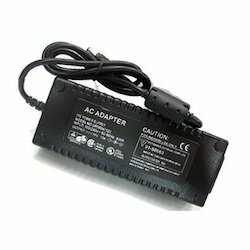 Only high quality components are used while manufacturing the offered adaptor, for increased compliance with latest market standards of quality. Designed with the help of latest technology, offered adaptor is used for protecting various electrical appliances from voltage fluctuations. In order to meet the varied needs of the clients, the offeredDC Adaptor is available in different specifications at economical prices. Current Capacity: 1.2 Amp. / 1.5 Amp.